It is not hard to learn how to grow cabbage. Cabbage (Brassica oleracea var. capitata) is a fairly easy plant to grow because it is a hardy vegetable. It grows quite well in fertile soil and sun or partially shaded areas of the garden. Cabbage comes in a variety of green shades, as well as purple or red. The shape of the head varies as well. Most cabbage varieties have smooth leaves but the Savoy cabbage leaves are crinkly. Growing cabbage is easy so long as you pick suitable varieties to your area. Practicing proper culture and managing insects will help your crop do well. 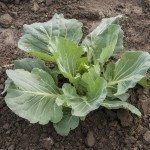 When planting cabbage, hardened plants can be very tolerant of frosts. Therefore, you can plant these early in the spring with other cool season vegetables. Late cabbage can be started during mid-summer, but remember that they won’t develop a head until fall. When growing cabbage, be sure to space the plants 12 to 24 inches (30-60 cm.) apart. The closer you space your cabbage plants, the smaller the head of the cabbage will be. Early varieties of cabbage can be planted 12 inches (30 cm.) apart and will grow one to 3-lb. heads. The later varieties can produce heads upwards of 8 pounds. Once you learn how to grow cabbage, you will have a great cabbage crop. Make sure to sow the cabbage seeds ¼ to ½ inch deep. After you sow them, keep them moist and thin them out to desired spacing once they grow. Make sure you fertilize your plants when growing cabbage, especially after transplanting. Then add nitrogen when the cabbage is half grown. This helps them mature better. Make sure the soil is moist throughout the growing season so your cabbage produces better heads. Anytime you see cabbage heads, the cabbage is ready to harvest. When growing cabbage, the highest yield can be had if you remember to cut the cabbage heads before they start to split. You can still harvest the cabbage after the head has split, but do so quickly, as the damage to the cabbage plant attracts disease and pests.